Betfair is one of the largest bookmakers company in Europe and is also a betting exchange marketplace. The company was founded 19 years ago in the UK. Betfair has more than one million registered users and the bookmaker certainly has confidence and authority in the industry. The main site is betfair.com, and except this betting site, customers can also use the betting exchange market, to play for or against each other on a sport events. There, the odds are much higher, but there is no variation on the standard betting site of the bookmaker. Promotions are also missing, as the company has an offer for new customers from the 100 euro bonus for sports on the site and EUR 20 for the Betfair Exchange Market. When we load the bookmaker site, we see that the main sports menu is clearly distinguishable. The drop-down menu is very convenient for all kinds of sports, where we can choose from a variety of sporting events. Of course, football and horse racing are two of the major areas in Betfair, but you can also bet on NFL, NBA, NHL, tennis and cricket. Like many bookmakers, Betfair is committed to offering many alternatives, such as political events, TV shows, and so on. Here you have the option of a live bet as the odds are very good. Live broadcasts are in very good quality, but your internet connection and the browser you use are also important. Registration is done in several steps. At the top of the site, on the right corner, the Button sign is clearly distinguishable and after pressing, follow the instructions. Registration is not difficult, as it is very true and accurate to fill in your personal details, e-mail, username and password. For added security, the bookmaker has asked a secret question and answer that only you can answer. The bonus code field is set to the bonus new sign up for new registered customers to participate in the 100 euro. Registration consists of Step 1 Personal Data and Step 2 Deposit. 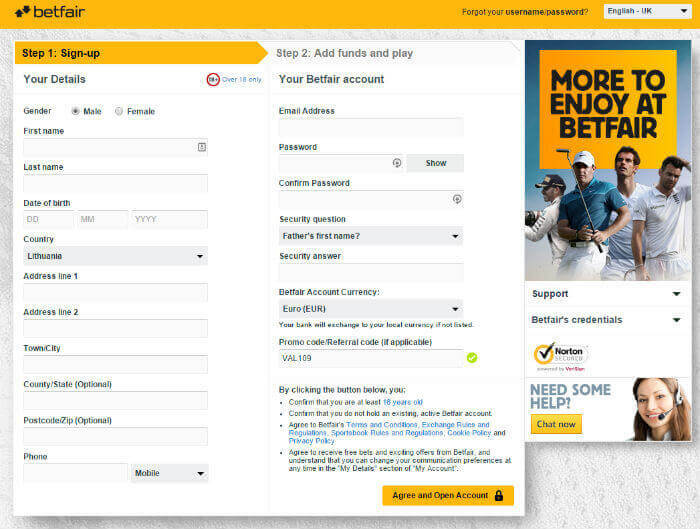 Betfair provides enough payment methods, such as Visa / MasterCard, Neteller, Skrill, Paysafe, Banking, ePay.bg and others. The minimum deposit varies from 5 to 15 euros according to the method. The maximum deposit is 45,000 euros with the Neteller or Skrill methods. All of these methods are instant deposit and only by bank transfer, the waiting period is up to 5 business days. In sports, you have the opportunity to receive a bonus of up to 100 euros for a first customer registration with 10×10 or 10 times x 10 euros. The bonus must be set at odds of minimum 1.50. For the sports market, the bonus is 100% up to 20 euros. With a 20 euro deposit and participation in the sports betting exchange, you can get a 100% bonus up to 20 euros. Betfair offers many live betting opportunities as well as standard bets for the most popular sports. Easy menu navigation and high odds are one of the reasons why the bookmaker has over 1 million registered customers from all over the world. When opening a football match, you have the option of placing multiple bets, such as 1 x 2, over, under goals, Asian handicaps, cards, corners, accurate scores and much more. We know, that the bookmaker is English company, so horse racing is one of its benefits, as you can play both live horse racing and virtual racing. One of the key benefits of Betfair is their horse base – all competitions all over the world are available, many of them with live video, which is rare in most leading bookmakers across Europe. Do not forget about the bonus of 100 euros in the sports section and for 20 euro in the sports market exchange. Betfair offers not only sports betting, but also casino games. You can enjoy a variety of roulette / standard and live / slots, card games, video slot, video poker, virtual games and more. The company offers an initial bonus for new players of 200 pounds, with scoring requirements being a 20x bonus. You can find over 200 games developed by Playtech. These include Baccarat, Craps, Roulette, Slots, Poker, Blackjack, and the majority of them have rising jackpots, giving you the opportunity to win huge amounts. The famous Ghost Rider, Thor, The Mummy, X-Men, Gladiator, Blade, Pink Panther are just part of the slot games available. Betfair also offers poker, except sport events, casino and virtual sports. Here the bookmaker has bet on one of the best softwares, which is of great importance to poker players, namely the iPoker Network. Graphics and design are at a high level, as well as the overall performance of poker rooms. Various tournaments and multiple prize pools are available. Poker tournaments start at a rate of about 2,3 euros and reach up to 100 euros. At Betfair Poker, around 200,000 players from different countries are playing, so the company has definitely made sure its customers are happy. Let’s not forget the 650 pound bonus for new customers – 100% Bonus Poker. Tel: 0344 871 0000 (UK) 1800 944 000 (IRE) 0044 203 059 8888 (other), and also use the live chan in the contact section or e-mail support.en@Betfair.com.